The huge success of the pretty Peugeot 206 has lead to an announcement by PSA Peugeot Citroen that it is looking to step up production of the Peugeot 206 hatchback and new 206 SW at Ryton, near Coventry. To satisfy current demand, production will need to increase to 230,000 vehicles next year (up 40,000 on 2001). To achieve this, the company will need to introduce a fourth shift at the plant and recruit an additional 700 employees. This will strengthen PSA Peugeot Citroën's position as one of the largest volume car producers in the UK along with Honda and Nissan. Last year 51% of Ryton's total production was exported. 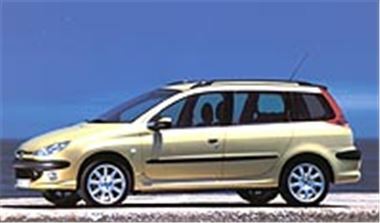 The Peugeot 206 was Europe's best selling vehicle in 2001. Ryton is the only plant in the PSA Peugeot Citroën group to produce the 206 SW.
* Total production in 2001 exceeded 190,000 units (187,797 in 2000). * Number two manufacturer in the UK after Nissan. * More 206s are made in the UK than any other car. * 63% of vehicles exported in 1999, 58% in 2000, 51% in 2001. * 500,000th 206 produced in August 2001. * 615,409 206s produced at Ryton, 1998 - March 2002. * 279,942 206s sold in the UK (to March 2002) since launch in October 1998. * Ryton is the sole producer of right-hand-drive 206s. * Over 3,000 employees involved in 206 production. * Peugeot's success responsible for 17,000 jobs in the UK (directly and indirectly). * 90 robots now in place and will increase in 2002.